How Artificial Intelligence (AI) Started? On this base of human strong will to achieve the impossible we started to design machines which can help us in our daily tasks! That’s how Neanderthals invented wheels-leading to Invention of Combustion Engines-propelling us to Industrial Revolution eventually development of Devices which decreases our Efforts and Meanwhile increasing our Efficiency. This single Motto of constant decreasing Human Efforts has been the core driving thrust to the place where we have reached today. Computers a term which is so common that it has been adjoined to our basic necessity. In 1822, Charles Babbage conceptualized and began developing the Difference Engine, considered to be the first automatic computing machine. The Difference Engine was capable of computing several sets of numbers and making hard copies of the results. Babbage received some help with development of the Difference Engine from Ada Lovelace considered by many to be the first computer programmer for her work and notes on the Difference Engine. Unfortunately, because of funding, Babbage was never able to complete a full-scale functional version of this machine. In June of 1991, the London Science Museum completed the Difference Engine No 2 for the bicentennial year of Babbage’s birth and later completed the printing mechanism in 2000. In 1942 the Iowa State University in US developed ABC an electrical computer that used vacuum tubes for digital computation, including binary math and Boolean logic and had no CPU. On October 19, 1973, the US Federal Judge Earl R. Larson signed his decision that the ENIAC patent by J. Presper Eckert and John Mauchly was invalid and named Atanasoff the inventor of the electronic digital computer. 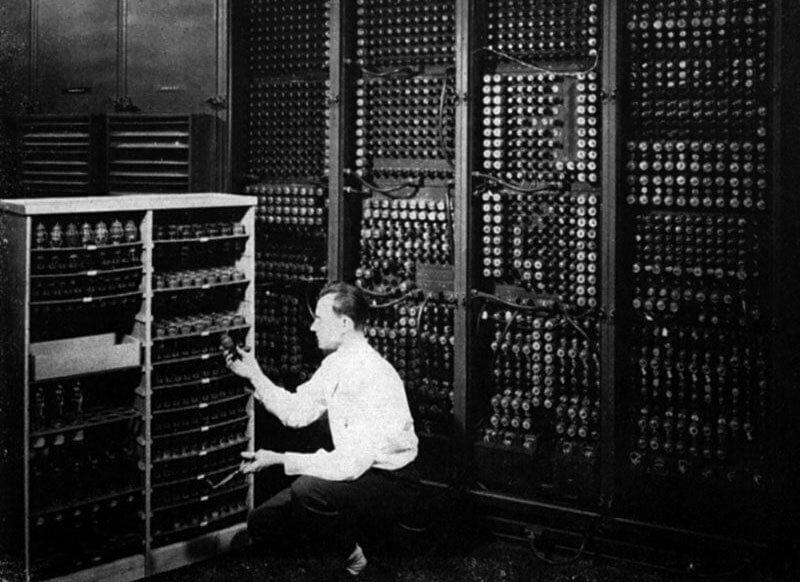 The ENIAC was invented by J.Presper Eckert and John Mauchly at the University of Pennsylvania and began construction in 1943 and was not completed until 1946. It occupied about 1,800 square feet and used about 18,000 vacuum tubes, weighing almost 50 tons. Although the Judge ruled that the ABC computer was the first digital computer, many still consider the ENIAC to be the first digital computer because it was fully functional. Then after as we all know in the 1970’s Microsoft made the software which the IBM wanted to run on their hardware revolutionize the computer world as it was efficient affordable and convenient to access.Years went on the technology got more sophisticated Apple with its Mac OS and IOS platform started to dominated the hand held computing technology with Google now a search giant and a conglomeration of tech companies lead to android which eventually has led to connection of almost all of mankind to such a phase where we are so connected and know so much within a fraction that seemed impossible to achieve years back. How Shall Artificial Intelligence affect us? World’s most renowned physicist Stephen Hawking has warned that AI can lead to early demise of Human Race;it has been supported by many great scientist and inventors Elon Musk said recently “Humans must merge with Machines or become Irrelevant in AI age”,Steve Wozniak Co-founder of Apple Inc. also warned us to be careful in development of AI. Summing it up in the next 10 years we can see a downfall of 150 million Jobs due to the implementation of AI and the immersing market shall face the highest downfall due to competitive market-place.